Built in 1930 by Pusey and Jones, Co., Wilmington DE., Bernard W. Doyle, Leominster, MA. Placed out of service, 25 March 1946, at Boston, MA. one Diesel-drive 25Kw 120V D.C.
one Diesel-drive 15Kw 120V D.C.
66k Mr. R. R. M. Carpenter's motor yacht, Galaxy, circa 1930. 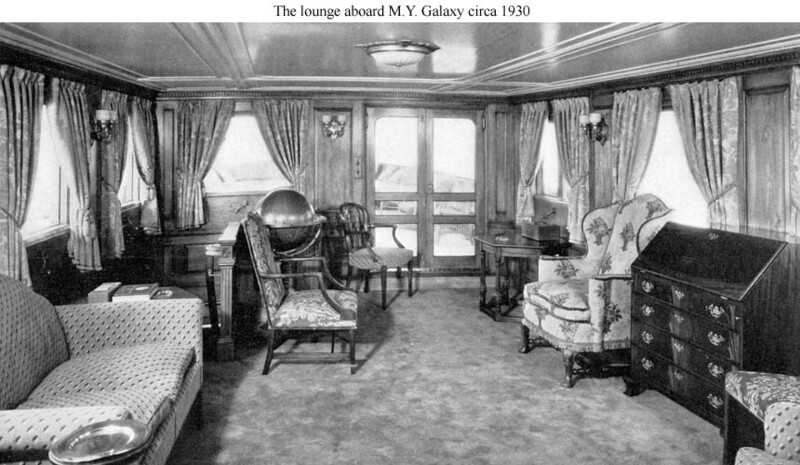 120k Mr. R. R. M. Carpenter's motor yacht, Galaxy lounge shown upon her completion in 1930. Located at the after end of the deck house, it was finished in old pine with yellow damask curtains and rust carpet, circa 1930.